I'm puzzled at the reaction among some disability activists in response to the Cheney-in-the-wheelchair affair. "And I can tell you again that metaphor here of the Vice President in that wheelchair - it is a metaphor for the low esteem with which he's held in this country. His numbers are pathetically low. ... are petty, and the energy could be better expended elsewhere. Some even accept and amplify the analogy. I don't agree, especially because the former vice president's use of a wheelchair became metaphorical fodder for a number of commentators ranging from the serious to the comedic. As a wheelchair user, I despise being used as a bad example, as a metaphor for punishment. If people with disabilities acquiesce to wearing an element of our lives as a mark of less-than, if we are assigned to appear in public as people suffering penalty, we are agreeing that others have a right to mistreat and exclude us. This goes beyond access and becomes a factor in the discussion of euthanasia. Of course, I have no right to dictate other people's responses, but I truly believe that the wealthy white men who comprise the chattering class have the displayed rank prejudice and ugly ignorance with their glib remarks about Cheney's wheelchair use. Gary, I agree with you so much. 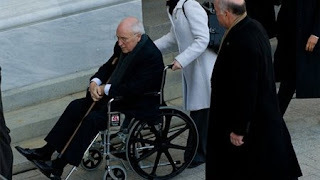 I dislike Cheney immensely, but his use of a wheelchair is certainly not reflective of his moral quality, and I find it offensive that people equate disability and inner evil. Certainly, these "wealthy white men" you speak of are betraying quite an evil aspect of their own selves. While I think most liberals making such jokes would squirm as soon as a wheelchair user gives them a sharp look about such a joke, people have got to think just a little more. I think a lot of the jokes have been knee-jerk reactions to deeply felt opinions about Cheney, but the fact that such statements come so automatically reveal deeply ingrained and automatic prejudices about disability. It's kind of telling, isn't it?